The area now known as Riverdale was settled before the Civil War. In 1887, a railroad, built from Atlanta and Fort Valley, passed through Riverdale. Farmers in the area provided wood for the railroad. In turn, the farmers would get fertilizer. As the railroad grew, it needed more land. Mr. and Mrs. W. S. Rivers donated their land for the railroad to grow, and their land grew to become one of the railroad's main stops. 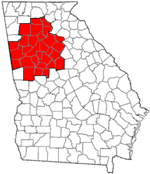 Riverdale is in western Clayton County, 12 miles (19 km) south of downtown Atlanta and 6 miles (10 km) northwest of Jonesboro, the county seat. According to the U.S. Census Bureau, Riverdale has an area of 4.5 square miles (11.6 km2), of which 0.012 square miles (0.03 km2), or 0.22%, is water. As of the census of 2000, there were 12,478 people, 4,389 households, and 3,107 families residing in the city. The population density was 2,926.3 people per square mile (1,130.9/km²). There were 4,590 housing units at an average density of 1,076.4 per square mile (416.0/km²). The racial makeup of the city was 20.09% White, 67.42% African American, 0.30% Native American, 7.73% Asian, 0.08% Pacific Islander, 2.28% from other races, and 2.10% from two or more races. Hispanic or Latino of any race were 4.81% of the population. There were 4,389 households out of which 44.6% had children under the age of 18 living with them, 39.3% were married couples living together, 25.2% had a female householder with no husband present, and 29.2% were non-families. 24.0% of all households were made up of individuals and 3.3% had someone living alone who was 65 years of age or older. The average household size was 2.80 and the average family size was 3.32. In the city, the population was spread out with 32.5% under the age of 18, 9.3% from 18 to 24, 36.1% from 25 to 44, 16.4% from 45 to 64, and 5.8% who were 65 years of age or older. The median age was 30 years. For every 100 females, there were 87.4 males. For every 100 females age 18 and over, there were 80.6 males. The median income for a household in the city was $39,530, and the median income for a family was $42,323. Males had a median income of $30,802 versus $26,102 for females. The per capita income for the city was $15,377. About 10.6% of families and 12.5% of the population were below the poverty line, including 14.0% of those under age 18 and 18.8% of those age 65 or over. The city is governed by a mayor and four council members. Each council member represents the entire city and is elected at-large. Council members come from the four wards that divide the city. The mayor and council appoint a city manager, who has oversight over five departments. These are roads with more than four lanes. These are roads with two to four lanes. Schools in Riverdale are in the Clayton County School System. Riverdale's main shopping district is along S.R. 85, between S.R. 138 and Gardenwalk Blvd, with a number of Asian, Hispanic, and African cultural stores. ^ a b "Geographic Identifiers: 2010 Demographic Profile Data (G001): Riverdale city, Georgia". U.S. Census Bureau, American Factfinder. Retrieved July 28, 2014.